1.High-power engine system, strong power. It is adopted turbine engine which power is 179kW. The powerful engine is enough and insures there is enough power for drill in different working conditions. 2.Rack and pinion sliding, to ensure the stability of the carriage and the reliability of drive operational. Power head floating. 3.Carriage and clamp use double floating patented technology can greatly protect the drill pipe thread, increase the service life of the drill pipe. 4.High-speed sliding and rotation systems, variable motor to achieve high and low power head sliding change, increasing the ability to adapt the drilling rig working conditions, improve the efficiency of the drilling rig construction. 5.Support the diverse needs of customers, the machine can be increased with the automatic (semi-automatic) drill pipe handling device, automatic anchoring system, cab, air conditioning wind, cold start, freezing mud, mud washing,mud throttling and other devices. 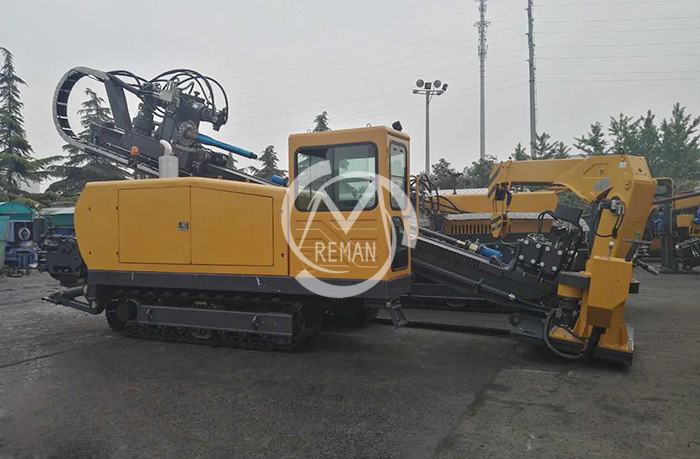 Remark: - Optional：Ⅰ.Semi-automatic pipeloader;Ⅱ.Single automatic anchor;Ⅲ.Dual automatic anchor;Ⅳ.Mud antifreeze;Ⅴ.Mud Cleaning.